Information on 4H clubs in the U.S.
Information on 4H clubs in Canada. Erin’s eyes are as bright as the lights from the exhibition grounds and she can barely tear herself away from the window. The night lasts a thousand years. When she finally sleeps, Erin will dream first prize with a pumpkin grown to twice her size. I’ve been going to fall fairs for as long as I can remember. When I was a girl, entertainment was a home-grown affair of baseball games, family picnics and soap box derbies. The highlight of the summer though, was always the agricultural fair. Who could sleep with such excitement at their doorstep: clowns and cotton candy, the petting farm and antique tractor parade, giant pumpkins and a scarecrow display. Now I enjoy taking my children to the local agricultural fair. It was probably their excitement that gave me the idea to write Going to the Fair . 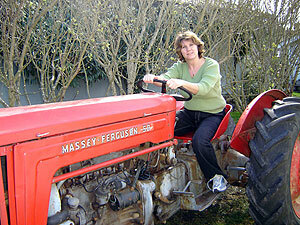 A picture of my tractor! They each like such different things. One wants to enter the antique tractor parade (yes, we bought a 1958 Massey-Ferguson tractor while I was doing the research for this book!) but my youngest loves the pettingfarm with bunnies, lambs and baby goats. My teenager likes to people-watch and eat her fill of junk food. 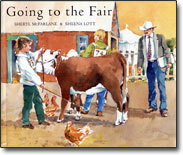 Most of those things went into the book, and of course, some of the things I enjoy too, like the flowers, quilts and Clydesdales and… Well, you’ll just have to visit the fair to discover the many more exciting possibilities that await you! Published by Orca Books: Victoria, 1996.